You can play a lot on an NES, but you know what you can't play on it? Stairway to Heaven. 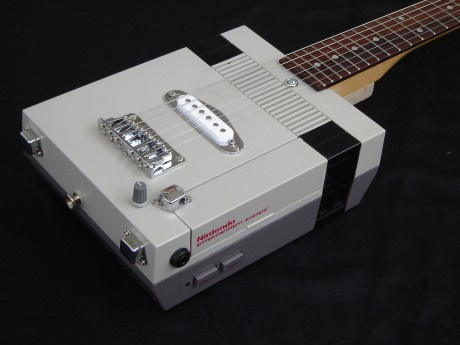 You could end all that injustice with an NES guitar. Get Lo-Fi (via This Is Why I'm Broke) makes and sells various configurations of the guitars — single coil pick-ups and rosewood or maple neck will set you back $155, while humbuckers and rosewood or maple will cost a bit more at $180. Shipping to USA addresses is $30; international is $65. At the moment there's a waiting list for every model, suggesting there's more demand for NES electric guitars than we could ever have imagined. Next up, how about some Game Boy castanets? honestly at first glance i thought it said "8 bit g string"
That is awesome I want one. The 8-bit sounds near the end that he plays are very cool. /me modifies the guitar to be lefty then plays it. Is there anything they can't make a NES out of? sweet i totally want one, but im going to have to buy another NES to do this though, because mine right now works perfectly fine (not to mention all the rage I would receive in my household from doing this to a perfectly working NES) i wonder if he could do this to my broken Sega Genesis? That video is missing a little montage. Sweet! The price is reasonable, too. Sweet!! That's my birthday present sorted for this year.So cool. Does he make other consoles.A megadrive 1 or a SNES would be super sweeeet!! Sweet! I'd so play one of these on stage in our church's praise band too! I Might just buy me one just to steal the humbucker pick up, and install a cheaper one on it instead. Humbuckers usually set you back $100 USD by themeselves. That's pretty cool, but the best console guitar has to be MegaDriver's Mega Drive guitar. You can find videos of it on YouTube. "Eye of the Tiger" will never sound the same again. Cool, but as always: Console abuse!! I wouldn't do it to my console!! Now, you're playing with power!!! Electric power!!! Nice little novelty there. Would be amused if somebody came onto stage with one of them. I bet this would sound even better if you played it while wearing the Power Glove. Color im impressed , thats whats up !